Class 12 student Sahithi Pingali’s award-winning research project on ‘An Innovative Crowdsourcing Approach to Monitoring Freshwater Bodies’ has not only won her awards in India and abroad, but she will now have a minor planet in the Milky Way Galaxy named after her. Well, this popular lullaby is now going to be a reality for grade 12 student Sahithi Pingali. Her research project on ‘An Innovative Crowdsourcing Approach to Monitoring Freshwater Bodies,’ has impressed the Lincoln Laboratory of the Massachusetts Institute of Technology (MIT) so much that it has decided to name a minor planet in the Milky Way Galaxy after her. Concerned over the growing pollution in Bengaluru’s water bodies, Pingali developed an integrated mobile phone app and lake monitoring kit to collect data on the polluted lakes of the city through crowd-sourcing. 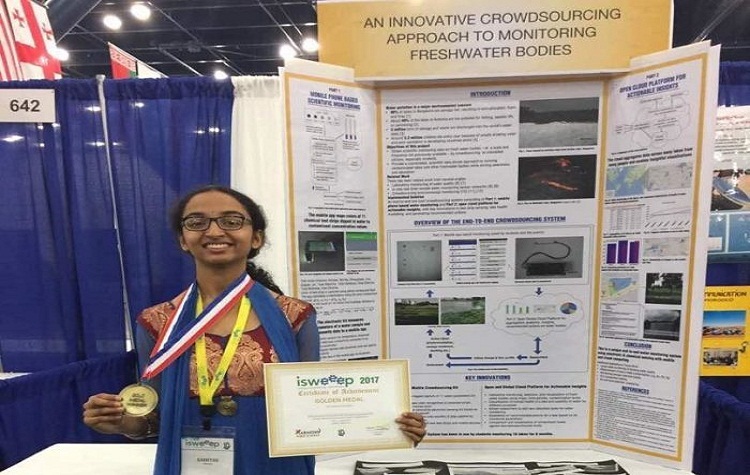 She entered the app in the Intel International Science and Engineering Fair (Intel ISEF) held at Los Angeles, and won three special awards and an overall second place in the Earth and Environmental Sciences category. For this achievement, the Lincoln Laboratory of MIT (which has the right to choose the name of minor planets) decided to name a planet after her. A student of Bengaluru’s Inventure Academy, Pingali had earlier this month won the Gold Medal at the ISWEEEP (The International Sustainable World Energy, Engineering & Environmental Project) Olympiad.